Hippie clothes. Bohemian clothing. Artsy clothing for expressive women! Retro classic gypsy hippie chick bohemian shabby chic styles for creative women. Handmade boutique styles at affordable prices. 100% Rayon Rasta African Dashiki Print sun dress. Traditional Indian shape and design. Fabric has some stretch and very comfortable. Two side pockets. This dress looks really nice worn with with leggings. 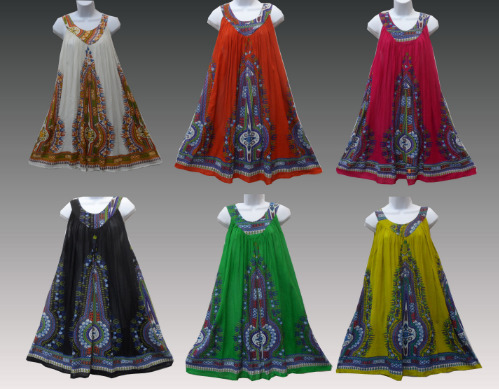 Because of the handmade nature of these garments, sizing varies. The measurements here represent an average measure of this garment. Bust measurements are taken with the garment stretched. Check the measurements below. Love these dresses for the light, airy, but not see through rayon, and the two pockets! The one size fits my 5'10" 165lbs bod, with room to spare... Going to order a few more to put away for the future!